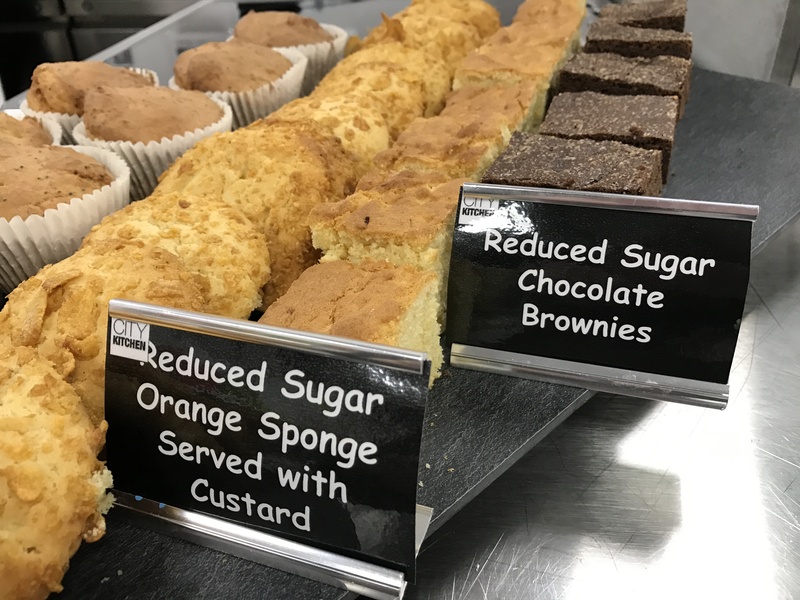 New recipes, different products and extra fruit and veg – they’re all steps being taken by Birmingham schools caterer Cityserve to cut the amount of sugar stocked by its schools by nearly a third over the next year. The award-winning Birmingham-based caterer will officially launch its ambitious plan to reduce the amount of sugar stocked by its schools at a special event featuring hands-on demonstrations, and at its headquarters in the city. Cityserve, the education catering division of Birmingham City Council, announced its sugar reduction plans earlier this year and has now revealed a series of steps to achieve its aim of reducing the amount of sugar stocked in its schools by 30% per child over the next 12 months. Development chef Simon Bishop will demonstrate one of the new recipes at the campaign’s official launch at Cityserve on Thursday, September 27th, which will be attended by children from The Abbey Catholic Primary School in Erdington, dignitaries and Cityserve staff. The special occasion also marks Cityserve’s 100th engagement with children from The Abbey as the 100th group to visit the organisation’s headquarters and get an insight into how their food is made at its on-site development kitchen CityKitchen. Their visit will see them learn about the ways Simon and his team are reducing any added sugar used by schools. Simon said: “We’ve come up with a whole range of ways to help schools reduce the amount of sugar they stock. At Cityserve our focus is always on the food and producing quality, tasty and healthy meals for children across Birmingham so looking at ways we can limit the use of any added sugar makes perfect sense. Cityserve, which provides more than 60,000 school meals every single day at schools across Birmingham, already provides children with low-sugar meals in line with the 2013 School Food Plan, which set out actions to transform what children eat in schools and how they learn about food. But following a review of school stock reports, head of service Dale Wild said they found that while some schools were managing their larders well with less than half a dozen kilos of sugar ordered per year, others exceeded it, prompting them to aim to reduce sugar usage in every school. He said: “This day is about showing that at Cityserve we’re drawing a line in the sand and taking active steps to ensure that we’re doing absolutely everything we can to ensure our meals are healthy as well as tasty. As the organisation that feeds so many children in Birmingham, we’re in a privileged position to be helping to lay the foundations for their future. The long-term benefits of sugar reduction on their lives are clear to see and we see it as our duty to do what we can to prevent obesity and diabetes, as well as other health issues, in the next generation. “As well as our recipe development and product substitution, we’re keen to engage with teachers and parents to make sure this kind of sugar reduction goes beyond the meals children eat at school and makes its way into the home.